Monoclonal expansion of the best high producing cells is time consuming. To reduce the time to screen and create a stable monoclonal antibody producing cell line, VyCAP is developing an innovative solution to select, isolate and expand the cell that produces the best quality antibody in the highest quantities. 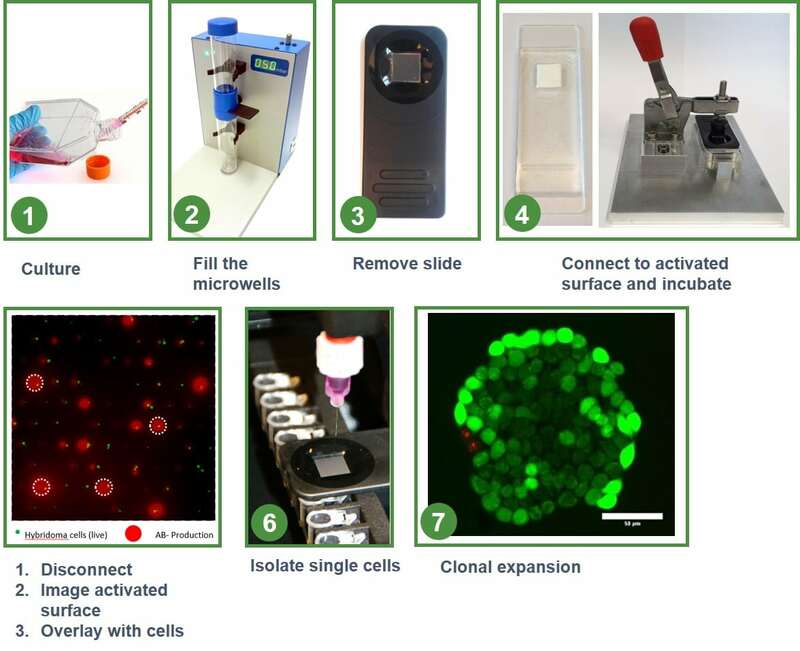 The innovative solution consists of a combination of our single cell microwell chip in connection with an activated surface. 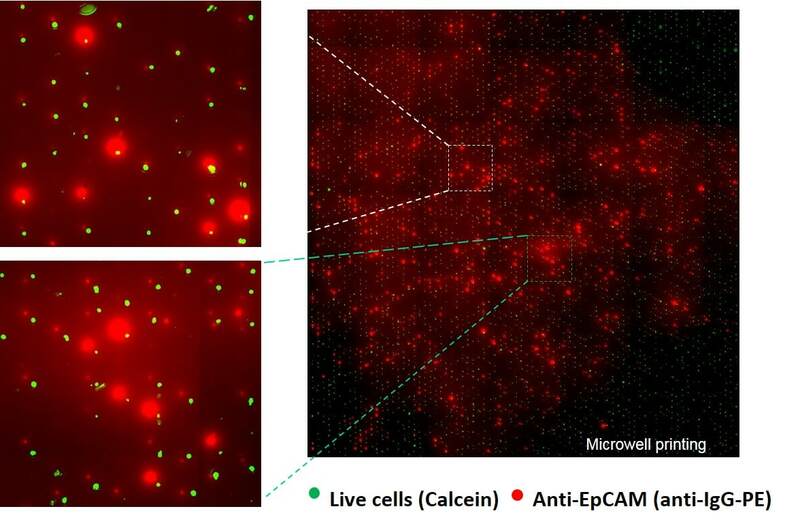 The antibody produced by the single cells is “printed” by the microwells onto this activated surface and detected and analyzed by using fluorescence or SPR. After the cells are distributed the microwells are connected to the activated surface with the membrane and pore facing the activated surface. The ensure a good connection between the microwell membrane and the activated surface, the microwell is mechanically clamped onto the surface. The microwells with cells and the clamped activated surface against it, is placed in a incubator. The cells will produce antibodies and these are printed through the pore onto the activated surface. Depending on the production rate of the cells this combination is left in the incubator for 8 – 48 hrs. After incubation the microwell chip and membrane with the printed antibodies are seperated from each other. The printed antibodies are made visible using an anit-IgG fluorescent label. Next the activated surface is scanned using one of the fluorescent channels of the Puncher system. The printed antibodies appear as bright fluorescent spots. The image below presents the cells in the microwells in green using clacein as fluorescent marker. The produced antibodies are fluorescently labelled and appear as the red larger dots. By correlating the location the printed spots with the location of the microwells the cells that produced the highest amount of antibodies can be relocated. Next these cells are isolated and transferred to a culture plate for clonal expansion.